There are a lot of chefs that I admire...and Julia Child is one of them! She's the author, chef and TV personality who introduced the French Cuisine to the Americans. But that's not all that I admire about her...it's actually her being fearless to be herself, and the way she taught the public that cooking can be easy and fun! Julia taught a lot of people (especially those who have the passion for food and cooking), including me, that cooking can be tricky but the best way to deal with it is to never stop trying and embrace every mistake in the kitchen as part of the learning process. This is a chocolate almond cake with chocolate icing and I tell you, it is extremely good! The recipe calls for short time baking so that the center remains slightly underdone. When I checked it after 25 minutes, the center of the cake seemed kinda watery so I decided to bake it 3 minutes longer. Well, it ended up a bit overcooked, hence is not as soft as it should be...but it's still moist inside. I made my cake 2 layers, filled and covered it with chocolate-butter icing, and we didn't see any form of dryness at all. My hubby and daughters said, it's just perfect! 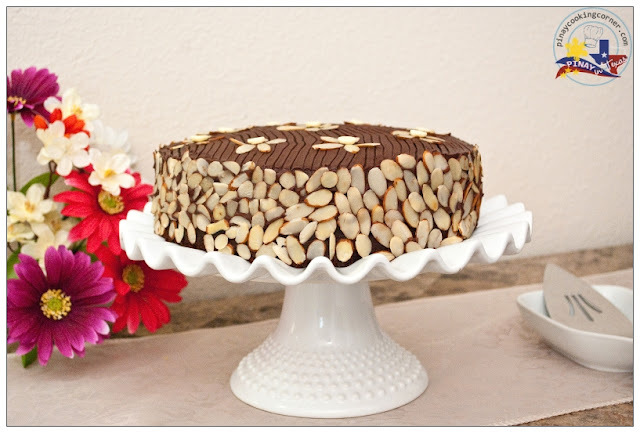 Note: Add about 1/2 cup sliced almonds to the ingredients for decoration. 1. Preheat oven to 350°F (175°C). Butter and flour the cake pan. 2. Set the chocolate and rum or coffee in a small pan, cover, and place (off heat) in a larger pan of almost simmering water; let melt while you proceed with the recipe. 3. Measure out the rest of the ingredients. Cream the butter and sugar together for several minutes until they form a pale yellow, fluffy mixture. Beat in the egg yolks until well blended. 4. Beat the egg whites and salt in a separate bowl until soft peaks are formed; sprinkle on the sugar and beat until stiff peaks are formed. 5. With a rubber spatula, blend the melted chocolate into the butter and sugar mixture, then stir in almonds, and almond extract. Immediately stir one fourth of the beaten egg whites to lighten the batter. Delicately fold in a third of the remaining whites and when partially blended, sift on one third of the flour and continue folding. 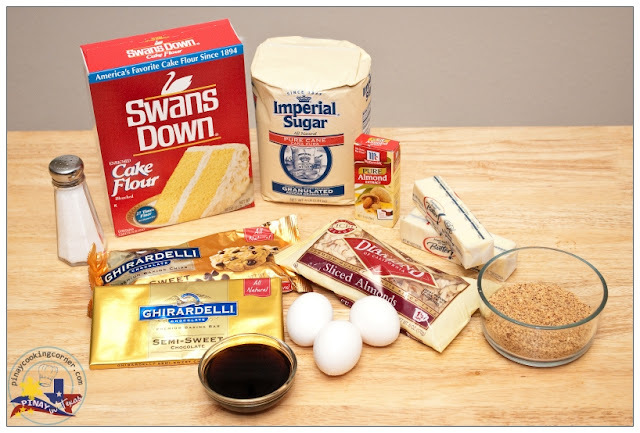 Alternate rapidly with more egg whites and more flour until all egg whites and flour are incorporated. 6. 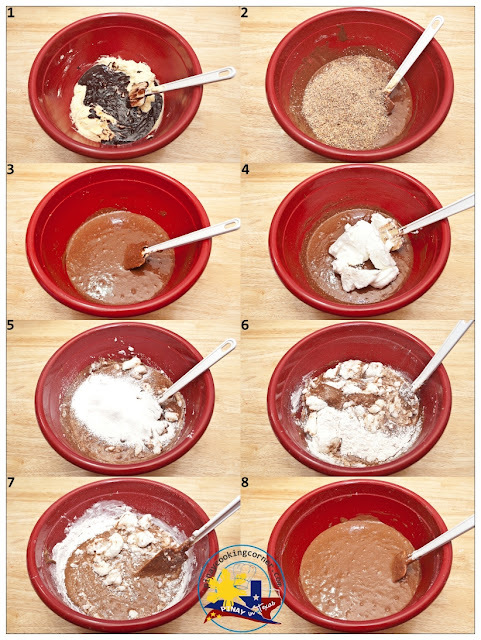 Turn the batter into the cake pan, pushing the batter up to its rim with a rubber spatula. Bake in middle level of preheated oven for about 25 minutes. 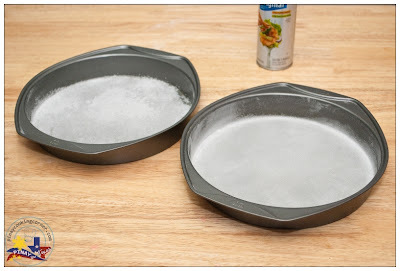 Cake is done when it has puffed, and 2-1/2 to 3 inches around the circumference are set so that a needle plunged into that area comes out clean; the center should move slightly if the pan is shaken, and a needle comes out oily. 7. Allow cake to cool in the pan for 10 minutes. Run knife around the edge of the pan, and reverse cake on the rack. Allow it to cool for an hour or two; it must be thoroughly cold if it is to be iced. 1. Place the chocolate and rum or coffee in the small pan, cover, and set in the larger pan of almost simmering water. Remove pans from heat and let chocolate melt for 5 minutes or so, until perfectly smooth. 2. Lift chocolate pan out of the hot water, and beat in the butter a tablespoon at a time. (I transferred the melted chocolate to a bowl before beating.) Then beat over the ice and water until chocolate mixture has cooled to spreading consistency. 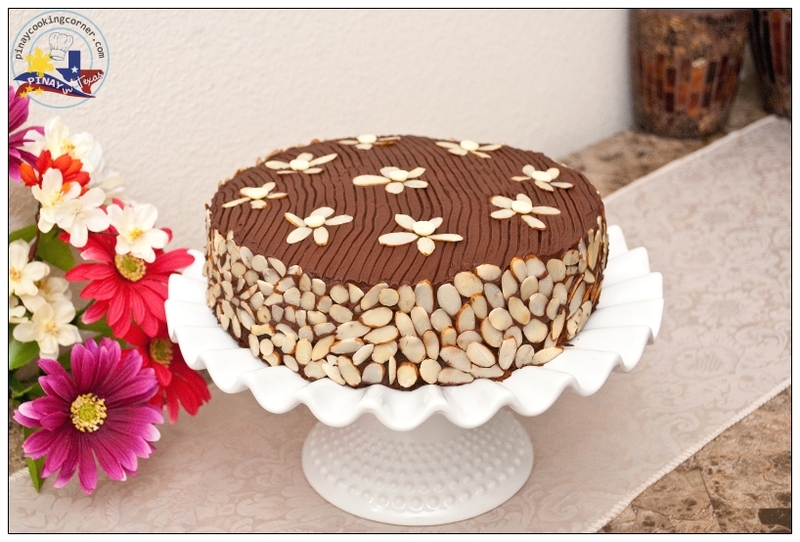 At once spread it over your cake with spatula or knife, and press a design of almonds over the icing. Hi Tina, your chocolate almond cake look excellent. Love the decoration so pretty and cute. Wow...very beautifully written post and lovely clicks..
Beautiful clicks makes me drool here..Love the almond decoration over the cake..
Love your step by step clicks. Nice presentation. That is one beautiful cake! Must be delicious too! Wat a beautiful and fantastic cake, too prefect! 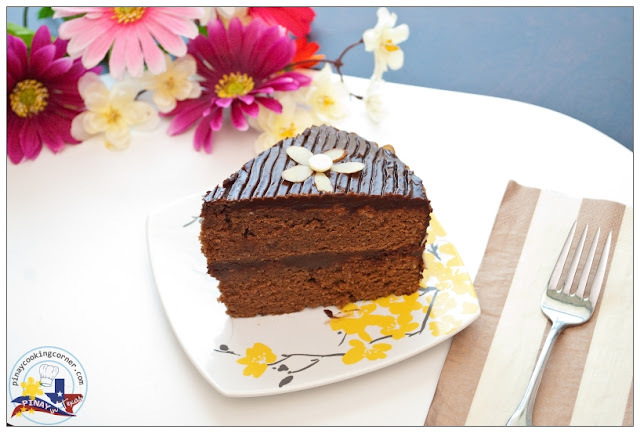 Love chocolate cakes and yours looks beautiful, Love the almond decoration and the inside, looking rich and yummy! Such a delicious and lusious cake Tina! Very elegant! you've made a gorgeous cake, Tina! Amazing cake, superb decoration, lovely step by step clicks! Wow,what a beautiful cake Tina,sound super delicious,chocolate and almond,superb !! Absolutely delicious. So cutely you made icing...amazing dear! Tina, Beautiful cake, lovely tribute to master chef. I love your clicks. Beautiful cake and lovely presentation. Thanks for all your wonderful comments! I really had fun baking and decorating this delicious cake! Great tribute to Julia,gorgeous cake and well written post,lovely clicks. 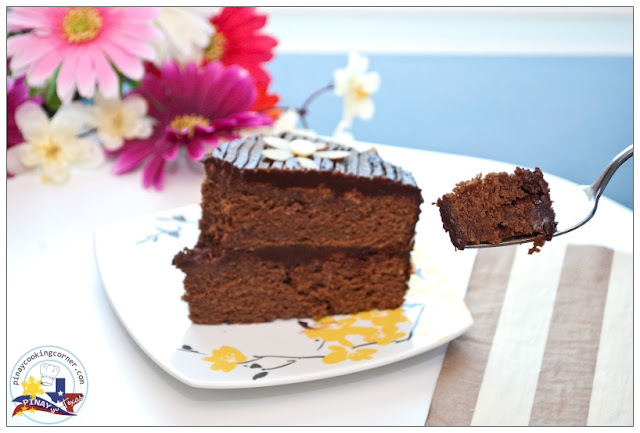 i love the way you made it into a double layer cake..it really is a delicious cake!!! This is a beautiful cake! And looks very delicious too. I like the little almond flowers on your cake. You are such a talented baker. 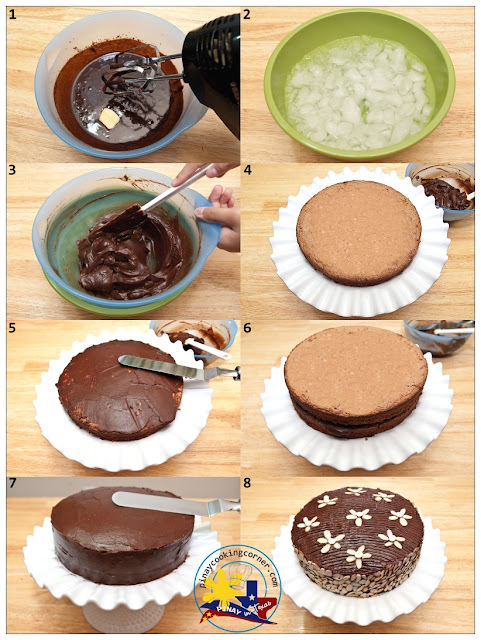 Love the step by step explanation of the cake.. Cake looks so beautiful..
Tnx Divya! Followed you back! Double treat!!! Cake looks very inviting.. Nice decoration..
What more can I say Tina, another fabulous cake you have made. Love the deco and I can't get enough of looking at the pics. love ur decoration looks so good.Glad to be in baking partner group. Beautiful cake and you decorated the cake like a pro. Your cake is gorgeous! Love how you made it into 2 layers!